The Social Services Department partners with faith-based social service providers while protecting the right of religious conscience. It supports initiatives that stabilize and improve funding to cover the true costs of programs that serve the poor and vulnerable. The department collaborates with state agencies to ensure that programs aiding senior citizens, families and children are adequate and efficient. It also advocates for legislation improving public assistance programs, such as food stamps, grants for home heating costs and rent assistance. 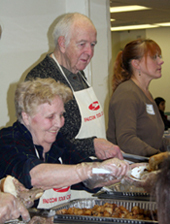 Catholic Charities serves needy individuals, families and children in each diocese. These faith-based agencies previously cared for children in state care by placing them in licensed, loving foster care and adoptive homes. A dispute in 2011 over the implementation of the state’s new civil union law resulted in the loss of state-funded foster care and adoption contracts. Marilou Gervacio serves as the CCI staff member for the Social Services Department. Representatives from each diocese make up the Social Services Department. Glenn Van Cura serves as the current chair of the department.